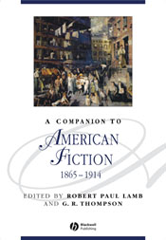 Editor/Author Lamb, Robert Paul and Thompson, G. R.
A Companion to American Fiction, 1865-1914 is a groundbreaking collection of essays written by leading critics for a wide audience of scholars, students, and interested general readers. An exceptionally broad-ranging and accessible Companion to the study of American fiction of the post-civil war period and the early twentieth century Brings together essays by top scholars, each of which presents a synthesis of the best research and offers an original perspective. - Divided into sections on historical traditions and genres, contexts and themes, and major authors. - Covers a mixture of canonical and the non-canonical themes, authors, literatures, and critical approaches. - Explores innovative topics, such as ecological literature and ecocriticism, children's literature, and the influence of Darwin on fiction.